C93 Steering damper control current does not flow to the solenoid valve. With ig turned on, ecm detects a failure of internal circuit element. Solenoid current does not converge to the target value. Battery voltage is 10 v or below with the engine running. Steering damper solenoid valve circuit interrupter element shorted. Steering damper solenoid valve circuit shorted to vcc. Steering damper solenoid valve circuit open. Steering damper solenoid valve circuit shorted. 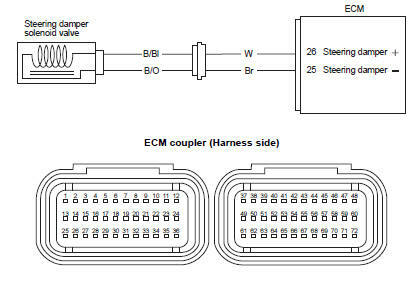 P1769 H Steering damper control current is higher than specified value. An abnormal current is detected during the vehicle standstill. Solenoid current is 0.7 A or above. 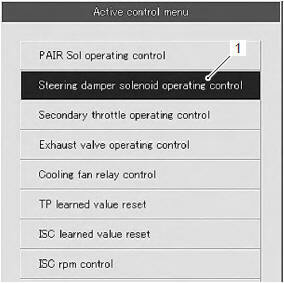 L Steering damper control current is lower than specified value. With ig turned on, ecm detects a discontinuity. An abnormal current is detected during the vehicle standstill. Check the steering damper solenoid valve coupler (1) for loose or poor contacts. If ok, then measure the steering damper solenoid valve resistance. Disconnect the steering damper solenoid valve coupler. Measure the steering damper solenoid valve resistance. Is the resistance ok? Go to step 2. Replace the steering damper with a new one. Measure the voltage between b/bl wire and ground. B/bl (w) wire shorted to vcc, or poor “26” connection failure. B/o (br) wire open or shorted to ground, or poor “25” connection failure. Replace the ecm with a known good one, and inspect it again. Low battery voltage or fuse is blown. B/bl (w) wire open or shorted to ground, or poor “26” connection failure. Raise the front wheel off the ground. 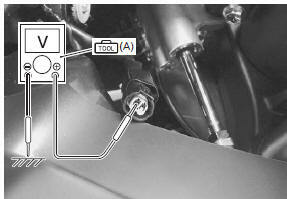 Click “steering damper solenoid operating control” (1). Click each button (2) on/off while turning the handlebars left and right. at this time, if the steering damping resistance changes from light to heavy by switching on/off, the function is normal.